Location: Monistrol-sur-Loire, in the Haute-Loire departement of France (Auvergne Region). Ownership / Access: Municipality of Haute-Loire. Notes: The Château des Évêques-du-Puy is a monument of Monistrol-sur-Loire in the department of Haute-Loire in France. 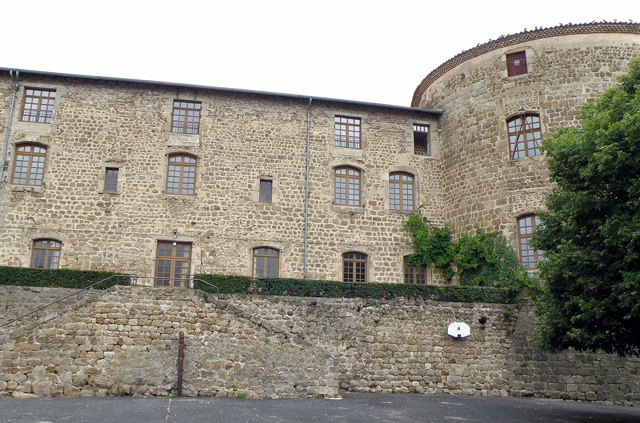 It was the summer residence of the Bishops of Puy until the Revolution, it houses the headquarters of the Tourist Office of Monistrol and Historical Society. 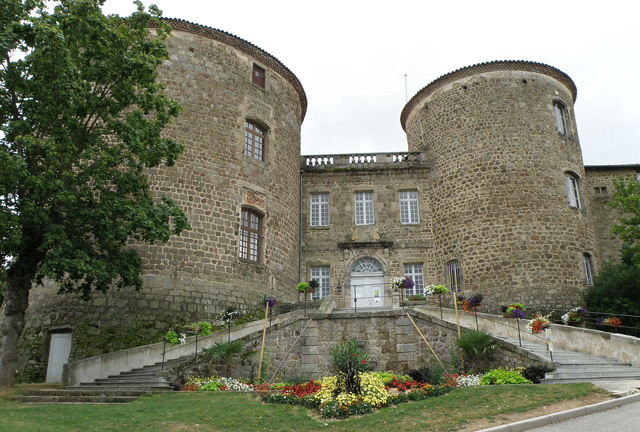 It hosts every summer exhibitions devoted to local heritage, and visit partially.In 1270, the bishop of Le Puy had acquired the lordship of Monistrol. His successors, abandoning the old castle situated below, began to build gradually on top of the mound of Monistrol, the current building. Thus was built in the fourteenth century, the southwestern facade, with its tower Buisson and door arch equipped with a harrow, and then in the fifteenth century, Monseigneur de Bourbon built the big tower. It will however later in the seventeenth century, when its substantially reduced size, on the initiative of Bishop de Bethune, the castle was remodeled in a classic sense: it accola him a monumental staircase with two degrees and ramp; a facade, flanked by two pavilions, the garden was created; we enlarged the park, which is decorated with statues. The last of the lords of Monistrol, Monseigneur Galard after the stairs again with a wrought iron railing in 1780, was forced to leave the castle for exile in 1791. The buildings and grounds were then sold one lot and then, in 1794, the park was dismembered and parceled. In 1838 it was decided to divide the castle, the eastern part becoming the Brothers' school, while the other half park side, first fell to individuals, then in 1909 was acquired by the hospital Monistrol to take its neighborhoods. In 1989, after the hospital, meanwhile become nursing home, had evacuated the castle to occupy new buildings in the garden, the municipality went purchaser of vacant premises and began to restore them.